HIAS 2015 will be held from 14 - 18 September 2015 by the Department of Nuclear Physics at The Australian National University, Canberra. There will be a welcome reception on the Sunday evening prior to the conference (13 September), with the first scientific session starting at 9:00am on Monday 14 September. Note that the University is approximately 15 minutes by taxi from Canberra airport (fare less than AUD$30). The conference will close around lunchtime on Friday 18 September. The E0 workshop will start at 9:00am on Friday 11 September, including a BBQ dinner that night, and concludes on Saturday 12 September. Enquires and questions about HIAS 2015 can be directed to the conference secretary. Please note that ALL travellers to Australia, other than Australian and New Zealand citizens, are legally required to hold a valid visa to travel to Australia. Many participants will be from countries that qualify for an e-visa or Electronic Travel Authority (ETA). The applications for these visas must be made online (available 24 hours a day, 7 days a week), and are usually processed very quickly. However you must obtain your VISA or ETA before leaving your home country. For E-Visa, (sub class 651), there is no charge for passport holders from the EU and a number of European countries. E-visa is available to passport holders from Andorra, Austria, Belgium, Bulgaria, Croatia, Cyprus, Czech Republic, Denmark, Estonia, Finland, France, Germany, Greece, Hungary, Iceland, Ireland, Italy, Latvia, Liechtenstein, Lithuania, Luxembourg, Malta, Monaco, Netherlands, Norway, Poland, Portugal, Romania, Republic of San Marino, Slovakia, Slovenia, Spain, Sweden, Switzerland, the United Kingdom of Great Britain and Northern Ireland, and Vatican City (Holy See). There is a small fee for an ETA (~AUD$20). Passport holders from Brunei - Darussalam, Canada, Hong Kong, Japan, Malaysia, Singapore, Republic of (South) Korea, or the United States should visit the ETA website. For complete information please see the Australian Government website. The venue for HIAS 2015 will be the Hedley Bull building (Building 130), adjacent to University House and Liversidge apartments and an approximately 6 minute walk from the Department of Nuclear Physics, Building 57, Garran Road, The Australian National University. 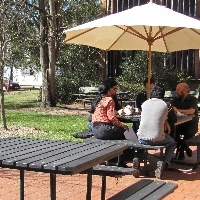 The Hedley Bull building is located at 130 Garran Road on the south-east side of the University. The Nuclear Physics building is located in the south-west corner of the University. Walking and cycle paths provide good access to the city centre, Floriade, Lake Burley Griffin, the Australian National Botanic Gardens and the National Museum of Australia, which are all within 2 kilometers of the department. Attendees should note that the conference dates coincide with the very popular Floriade display in Canberra, and alternative accommodation outside the university will require early booking. Accordingly, a block booking of accommodation for the period 11 - 17 September has been made for attendees on the ANU campus, and at the nearby Quest apartments. The block booking comprises of a mixture of twin rooms, queen suites and one and two bedroom apartments. Costs per night range between AUD$141 per night for a one bedroom apartment (min. 7 nights) to AUD$229 for a two bedroom "family" apartment. Breakfast packages may also be available for a small additional fee. This accommodation is limited and will be allocated in order of registration. If making a direct booking on the ANU campus or at Quest please ensure the accommodation provider is aware you are part of the HIAS 2015 block booking to receive the above-mentioned rates. Bookings must be in place 30 days in advance. Cancellation fees may apply. Information on other accommodation options nearby that attendees will be able to book themselves is provided below. 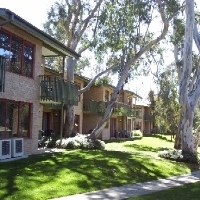 Accommodation booking details can be found on the University Accommodation (apartments), University House (rooms) and Quest Canberra (apartments) websites. Our conference secretary may also be able to provide assistance with accommodation bookings if required.